Borderland Religion narrates, presents and interprets the fascinating and significant practices when borders, migrants and religion intersect. This collection of original essays combines theology, philosophy and sociology to examine diverse religious issues surrounding external national borders and internal domestic borders as these are challenged by the unstoppable flow of documented and undocumented migrants. 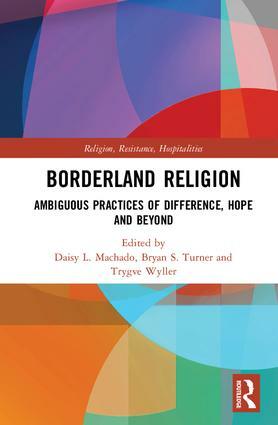 While many studies of migration have examined how religion plays a major role in the assimilation and integration of waves of migration, this volume looks at a number of empirical studies of how emergent religious practices arise around border crossings. The volume begins with a detailed analysis of the borderland religion context and research. The aim is to bring an eschatological interpretation of the borderland religion, its impact and significance for migrants. Themes include a critical analysis of how religion has formatted Europe; empirical studies from the US/Mexican border and Southern Africa; an overview of the European refugee crisis in 2015; editors’ account of borderland religion from the perspective of citizenship studies. Contributions of scholars from a broad range of disciplines ensure a careful analysis of this highly topical situation. The volume’s interdisciplinary profile will appeal to scholars and students in religious studies, migration studies, theology and citizenship studies. Daisy L. Machado serves as Professor of Church History at the Union Theological Seminary in New York. Her scholarship focuses specifically on United States Christianities. A native of Cuba and raised in New York, she has published and lectured intensively on border issues, especially the US/ Latin-American. Bryan S. Turner is one of the world’s leading sociologists of religion and he is founding Director of the Institute for Religion, Politics and Society at the Australian Catholic University, Sydney. He is also the Director of the Centre for Citizenship, Social Pluralism and Religious Diversity in Potsdam University, Germany. His research interests include globalisation and religion, religious conflict and the modern state, and human rights and religion. Trygve Wyller is a Professor of Contemporary Theology and the Studies of Christian Social Practice at the Faculty of Theology, University of Oslo, Norway and Honorary Professor at the School of Religion, Philosophy and Classics at the University of KwaZulu-Natal, South Africa. He has published on migration, ethics and ecclesiology both from a dogmatical, spatial, and phenomenological perspective.